Darlene Hightower and her Rush University Medical Center colleague LaDawne Jenkins laid out a map of Chicago's West Side across two folding tables in the recreation hall in Pleasant Grove Baptist Church's basement. The map showed parks, museums, health centers, schools and other community assets. Hightower, associate vice president of the office of community engagement at Rush, talked with a small group of longtime West Side residents about the area's access to healthcare, its economic vitality, infrastructure and schools. The conversation was held Nov. 5 by West Side United, a coalition of health systems, public institutions, residents and community groups formed in 2017. Rush led dozens of such “learning map” meetings throughout the West Side to learn what residents needed and how to meet those needs. “We want to know how the residents think so it's not an institution-driven effort,” Hightower said. The academic medical center uses the information to inform its community health needs assessment, which the Internal Revenue Service began to require in 2012 as part of the Affordable Care Act. It also directs Rush's movement into population health management as the industry recognizes that housing conditions, education and job opportunity directly impact a person's health. But without explicit rules guiding hospitals' interventions or setting a baseline level of funding, community benefit programs and their spending vary wildly. And as not-for-profit systems grow, public officials, community leaders and healthcare researchers have questioned whether community benefit programs justify providers' tax exemptions. At a minimum, industry observers want to better track hospitals' impact year to year. Yet, establishing tighter rules on hospitals, which can be a locus for community pride and economic activity, is a difficult task. Executives at not-for-profit hospitals claim that a rigid mandate would exacerbate an already tenuous financial situation. The disparities are significant. Residents of a neighborhood near where the Rush-led meeting took place, West Garfield Park, have a life expectancy of 69 years. Just six miles away, for residents in the high rises of the Loop, it's 85 years, according to data from the Illinois Department of Public Health. Problems identified in the West Side ranged from a lack of major grocery stores to unchecked mental health issues and systemic racism that keeps the school-to-prison pipeline flowing. Efforts to improve communities have largely been siloed across the country even though hospitals would benefit from a cooperative approach. The IRS tracks community benefit spending through not-for-profit hospitals' Form 990s. They now include a Schedule H portion, a section of the tax document that was added as part of the ACA's attempt to try to capture all of a hospital's community benefit spending. But a Modern Healthcare analysis of about 100 Illinois hospitals' tax forms revealed that measuring community benefit spending through Form 990 filings can provide an inconsistent and distorted view of a hospital's impact. Find out more about how and why community benefit reporting for some hospitals is distorted. The patient mix at Mount Sinai Hospital Medical Center, a safety-net hospital on Chicago's West Side, was around 38% Medicaid beneficiaries in 2015, according to Medicare cost reports collected through Modern Healthcare Metrics. Mount Sinai received about $2.5 million in Medicare disproportionate-share hospital payments in 2015, amounting to nearly 5.4% of its total Medicare revenue, which was about three times the national average. Mount Sinai followed the IRS' rules and did not report an influx of Medicaid reimbursement when calculating its community benefit spending as a percentage of its total expenses. In fiscal 2015, the hospital received $194.9 million in revenue from Medicaid and spent only $50.6 million treating those patients. This translated to a negative $119.3 million in net community benefit spending. Yet, its community benefit spending as a percentage of total expenses only calculated its charity care, community health services, health professions education and in-kind contributions for community benefit, landing it at 9.1%. Its Medicaid surplus wasn't factored in. That's per an IRS directive, which tells hospitals not to report negative percentages. If the Medicaid surplus were included, it would've amounted to a negative 36.8% net community benefit spending as a percentage of total expenses. Mount Sinai said its 2015 and 2016 returns were filed incorrectly and it is currently amending them. “However, I can tell you that, as a safety-net hospital that takes a disproportionate share of uninsured, under-insured, Medicaid, Medicare and charity patients, we do not have a Medicaid surplus,” a spokesperson told Modern Healthcare. Hospitals could end up with a Medicaid surplus due to a large adjustment from a prior year cost report settlement. The hospital may also receive large DSH payment adjustments or may receive other supplemental payments from Medicaid, said Jan Smith, a managing tax director at consultancy Crowe. Some question the regulatory requirements for Schedule H reporting, especially since it's hard to tell if hospitals are helping improve communities year over year. “The bottom line is that the community benefit reporting system on Schedule H is not a perfect system, and users of the schedule must look beyond the numbers reported in order to capture the hospital's entire community benefit contribution,” she said. The IRS only relayed its policy instructing hospitals to not report negative percentages and did not explain the rationale when asked by Modern Healthcare. In Illinois, community benefit spending has dipped from fiscal 2013 to 2016, according to Modern Healthcare's analysis. Around 9.1% of the hospitals' total expenses were dedicated to community benefit programs in 2013, compared with 8.2% in 2016, though not all hospitals had reported for 2016. Percentages for individual hospitals ranged from 0% to 28.6%. The Medicaid shortfall, or the gap between Medicaid payments and the hospital's estimated cost for those services typically calculated by its cost-to-charge ratio, increased from 31.4% of a hospital's total community benefit spending in 2013 to 41.1% in 2016. Charity care, or free or subsidized services provided for the uninsured or under-insured, fell from 29.7% of overall community benefit calculations in 2013 to 17.7% in 2016. 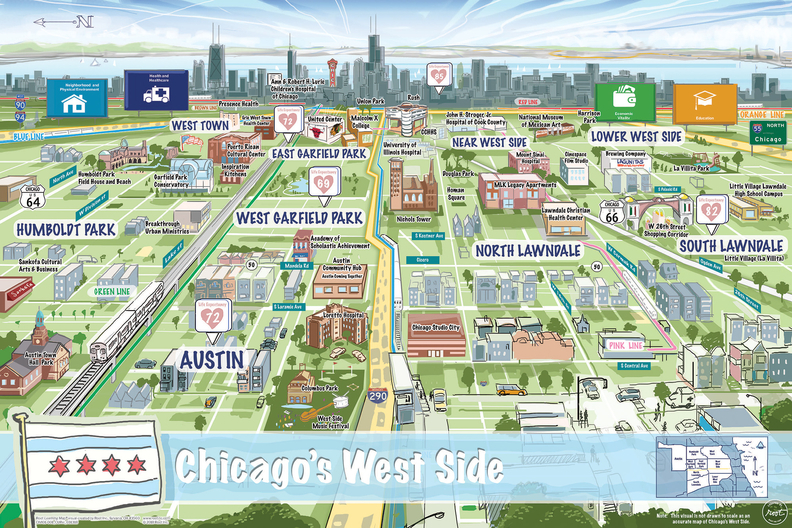 A coalition of health systems, public institutions, residents and community groups in Chicago are working to take on social determinants of health. Others claim that subsidized care is a critical measurement of a hospital's community impact. As Illinois hospitals' charity care dropped after more people gained healthcare coverage, so did their net community benefit spending. This suggests that hospitals aren't reallocating investment to other community programs. “We're not seeing that reinvestment from dwindling charity care,” said Young, whose analysis of 1,501 not-for-profit hospitals showed that community benefit spending only slightly increased from 7.6% of their operating expenses in 2010 to 8.1% in 2014. A significant portion, about a fifth, of community benefit spending went toward “health professions education” costs, much of which funded workforce training and development. Outreach programs, including community health improvement services and direct cash contributions for community benefit, represented a small share of overall community benefit spending, hovering around 3% each for Modern Healthcare's Illinois data set. Subsidized health services and research represented around 10% and 5% of total community benefit spending, respectively. Hospitals in low-income areas have to spend more on free and subsidized care, which means they spend less on preventive community programs. Conversely, hospitals in affluent areas have the flexibility to spend more on community programs, arguably where they're needed less. This dynamic perpetuates the status quo. “It's a vicious cycle,” Young said. The narrative section of the IRS Form 990 can feature a range of expenses related to such things as expanding nutrition programs, providing health screenings, hosting behavioral health support groups, opening outpatient clinics for specialty care and hiring new chronic disease doctors, according to a Modern Healthcare analysis. It also includes promoting participation in hospitals' online portals, offering online educational materials related to the insurance marketplace, promoting preventive-care resources on its website, provider-to-provider telephone consults, and sponsorships focused on wellness and healthy eating. Little differentiates community benefit programs that are self-serving from those that truly benefit communities, said Paul Keckley, an industry consultant and managing editor of the Keckley Report. “It gets hazy when a hospital is screening someone for a joint replacement or Type 2 diabetes—is that marketing or community benefit?” Keckley said. The difference is not lost on cash-starved communities that are eyeballing unrecouped property and sales taxes resulting from having a potentially cash-rich, not-for-profit hospital in their community. Hence the phrase “no margin, no mission,” which the not-for-profit sector often touts as they focus on financial health. But public officials, including Sen. Chuck Grassley (R-Iowa), have become even more wary as they see not-for-profit health systems expand their stronghold on regional markets and executive salaries balloon. Grassley said in November that he plans to rejoin the Senate Finance Committee, which means that he can reinvigorate oversight of tax-exempt healthcare providers, said Michael Peregrine, a partner at law firm McDermott Will & Emery. “These companies are now basically for-profit entities in sheep's clothing,” said David Miller of Service Employees International Union-United Healthcare Workers West. In September, the Illinois Supreme Court upheld the tax breaks that benefit each of the state's 157 not-for-profit hospitals. The annual property tax exemptions amount to tens of millions dollars apiece for some of Chicago's largest hospitals. The decision capped a near decadelong legal battle debating whether the tax-exempt properties were used solely for charitable purposes. The 2012 law in question says that hospitals must quantify the value of their tax exemption and provide at least as much value in treating the poor, thus relieving government's burden. Hospitals use a three-year average of charity care to determine a dollar value, and then can fund other charitable healthcare organizations to make up any gap. Public officials in Ohio, New Jersey and Pennsylvania also have challenged hospitals' tax exemptions. In 2015, Morristown (N.J.) Medical Center agreed to pay $26 million to city coffers to end a protracted dispute over its property tax exemption. With the increasing focus on social determinants of health, hospitals and systems are realizing that public health issues need to be tackled together. The Illinois Public Health Institute spearheaded the Health Impact Collaborative of Cook County, which includes 26 hospitals, seven health departments and nearly 100 community organizations. The collaborative was formed in 2015 to facilitate data and resource sharing to improve community health needs assessments. Its 243-page report outlines the following priorities: improving social, economic and structural determinants of health, improving mental health and decreasing substance abuse, preventing and reducing chronic disease, and increasing access to care and community resources. Advocate Health Care, which joined the collaborative before it merged with Milwaukee-based Aurora Health Care, revamped its community health arm four years ago, said Bonnie Condon, vice president of community health and faith outreach for Advocate Aurora Health. It hired staff with public health expertise who helped it design new evidence-based programs through a public health lens, she said. But many hospitals do not capture all their community benefit impact. One of the most underreported areas is subsidized services, experts said. “Those are services that the hospital keeps going even though it keeps losing money because they're needed by the community,” said Julie Trocchio, senior director of community benefit and continuing care at the Catholic Health Association. HHS Secretary Alex Azar said in November that Medicaid may soon allow hospitals and health systems to directly pay for housing, healthy food or other needs affecting health. “The evidence shows that health fairs and screenings don't make a big difference,” Condon said. “What does is working on access and health equity and impacting other social conditions.” According to the AHA's 2016 annual survey, the second-most common community benefit programs were health fairs, preceded by community health education. And there is a lot of variation between how different hospitals under the same system report their community benefit spending, said Don Stuart, partner at the law firm Waller Lansden Dortch & Davis. “For the most part, people are making a good faith effort to collectively report their community benefits, but when numbers are involved there is some discrepancy,” he said. In the current Form 990 framework, community building activities are not counted in a hospital's total community benefit spending, which could deter investment in those areas. Those building activities include physical and environmental improvements and housing, and economic, leadership and workforce development. The Catholic Health Association, which unsuccessfully lobbied the IRS to change that, has recommended that hospitals move their community building expenses into community health improvement reporting, which is counted in their overall total, Trocchio said. The for-profit provider community has taken issue with hospitals' tax-exempt status because they say it is creating an uneven playing field, Keckley said. Not-for-profits are getting the benefit of a tax exemption although for-profits provide comparable levels of community benefit, they argue. Not to mention, local and state jurisdictions are missing out on millions of tax revenue every year. Johns Hopkins researchers looked at how not-for-profit providers' community benefit spending in 2012 compared to for-profit providers. They found that the incremental community benefits that not-for-profit hospitals provide beyond what for-profits offer average 5.7% of total expenses, which aligns with the average value of not-for-profits' tax exemption of 5.9%. Although, the incremental community benefit exceeds the tax exemption for only 62% of 1,648 not-for-profit hospitals analyzed. Total community benefits of not-for-profit hospitals averaged 7.6% of expenses. “Even with this most liberal interpretation, I was a little surprised that as many as a quarter of not-for-profit hospitals are deemed as not doing enough to justify their tax exemptions,” said Bradley Herring, an associate professor at Johns Hopkins Bloomberg School of Public Health and the study's lead author. Many experts were against setting an absolute benchmark that requires hospitals' community benefit spending to meet a certain percentage of total expenses. An absolute measure would not consider the hospital's patient mix and financial situation. It could even cause some high-performing hospitals to give less. While a rigid benchmark may not work, something should account for the scale of the hospital and health system, said Kenneth Vorrasi, a partner at Drinker Biddle. “I don't see anything wrong with expecting more from those that are bigger and have the scale to do it,” he said. Defining what a community needs varies by each resident. Without frequent re-assessments, the disconnect between a hospital's mission and the community's expectations will likely grow, Crowe's Smith said. “Hospitals are doing a better job of communicating with the community through these needs assessment reports, but some people may not see a hospital's entire community benefit picture,” she said. That's why members of West Side United in Chicago will continue to attend community events, meet with residents and support local businesses, Rush's Hightower said. “We want to be like family, and get invited to the family barbecue,” she said. —Tara Bannow contributed to this report.